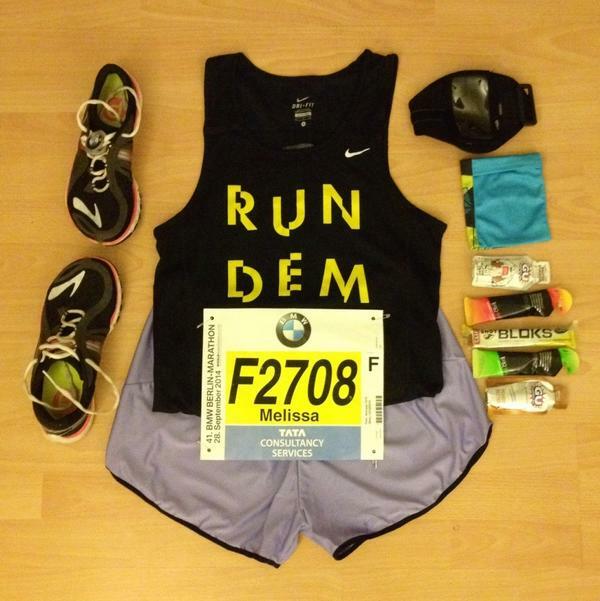 River Runner: Berlin Marathon - Follow Me Tomorrow! Berlin Marathon - Follow Me Tomorrow! Tomorrow I will run the Berlin marathon. It’ll be my 4th marathon, and my first time in the city in over 14 years. I accidentally got a ballot spot late last year, and I figured it’d be a good backup should things not go well in London marathon. But, having achieved everything I wanted in London, I was left with a bit of “what now?” in my goals for Berlin. So I decided that I really just would like to run a well-paced race for once, with no real time expectation. Classic Melissa is to set off like a jackrabbit then steadily get slower as the race goes on, so this time around I’m just going to concentrate on going (what feels like) incredibly slow and see if I can maintain an even pace throughout, whether that means I finish in 3:15 or 4:00! 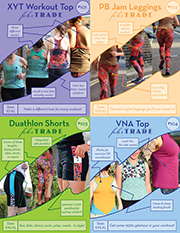 I’m happy to be representing the speedy boys in my crew by wearing one of the new Run Dem Crew Elites vests on top, and on my bottom half I’ll be wearing the lavender version of my newest sewing pattern, the Threshold Shorts. These are designed specifically for running so what better way to prove my confidence in the design than by running an entire marathon in them, eh? On my feet will be my newest shoes, the Brooks Pure Drift, since they’ve got a bit more cushioning underneath, but are still lightweight and with ample toe room. 1. The official Berlin marathon app (search for “Fehr”), which should show my position at every 5km and guesstimates in between. Note that the tracking portion of the site will only appear on race day – Sunday 28 September (the mass start is at 8:45am Central European Summertime). Now, it’s very unlikely that I’ll be able to get a German pre-pay SIM with affordable data on the day, so the above may be the only option. But in case I do, the below interactive options also work! 3. DailyMile – join dailymile.com and send me a friend request before tonight, and you can access the same tracking link, and also any comments added to my post while I’m running will also be spoken into my headphones. The advantage here is that Runmeter will poll Daily Mile something like every 5min throughout the race, so if the 3G is down at the start, it’ll just post it at the next opportunity, then updated as it gets info from my phone. My profile is here After you sign up, hit the “Add Friend” button on the left under my photo. And if all else fails, the thought of a massive beer stein and pretzel at the end will get me over the finish line! Good luck! Remember ….. It’s all about the recovery!